This offer expires at Monday 03/19/12 11:59 PM EST. There are no shipping or handling fees and you do not have to worry about automatic renewals. 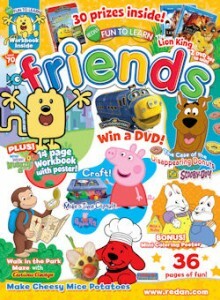 Ranger Rick Magazine is for boys and girls ages 7-12. Each issue is packed with full-color photos of animals and stories of adventure. Ranger Rick is published by the National Wildlife Federation and focuses on teaching young kids about wildlife, nature and conservation. This magazine subscription is perfect for children who love the outdoors and animals. Here is a great offer for All You Magazine . You can get an annual subscription for just $12 or $1 an issue! Each magazine has a bunch of great articles plus tons of exclusive coupons. The coupons only in this magazine are worth the $1. Coupons: Every issue of All You contains valuable coupons for fashion, food, makeup and household basics. With high coupon totals each month (more than $60 recently), this magazine pays for itself many times over. Advice on living well for less: Throughout every issue are exclusive money-saving ideas for every area of your life. You’ll benefit from invaluable tips on couponing, smart shopping, bargain hunting, price negotiating, home decorating, discovering inexpensive beauty and fashion products, and much more. Realistic health and fitness ideas: Most of us should improve our health or diet or exercise routine somehow. But change is hard. So All You gives the hard facts and concise plans you need to make better lifestyle choices. Whether you’re looking to lose weight, firm up or create more healthful meals, our stories have the up-to-date, proven information you need, presented in a format that’s easy to understand. Affordable, delicious family-friendly recipes: Grocery costs make up a huge part of every household budget. That’s why All You offers an unparalleled selection of inventive and inexpensive recipes for daily dinners, special occasions and tempting treats–many for just pennies a serving! Better yet: All the ingredients are readily available at local markets. The “Reality-Check” promise: The heart of All You is our “Reality Check” promise. We reach out to our exclusive network of more than 40,000 women to get their advice–and we feature them and their ideas prominently throughout every issue. The magazine also goes in-depth every month, bringing you inspiring first-person stories of women who have overcome challenges in their lives, from financial burdens that seemed impossible to surmount to life-threatening illness and natural disasters. Your most important questions answered: In each issue an All You recruits experts (all of them women) in key areas–health, relationships, pet care, fitness, nutrition and money savings–and asks them the most pressing questions in their fields. You get unbeatable access to clear thinking on thorny issues, like how to pay off your credit cards, deal with a fussy in-law and lose that baby weight. Shape Magazine For Just $3 a Year! Today only you can order Shape magazine as low as $3.00 a year. This offer expires at Wednesday 03/07/12 11:59 PM EST. There are no shipping or handling fees and you do not have to worry about automatic renewals. Budget Travel Magazine For Just $3.99! I am a huge fan of Budget Travel magazine and right now you can get it for as low as $3.99 a year! If you are looking for a great last minute gift, magazine subscriptions are perfect. Plus DiscountMags is having a Last Minute Gift Subscription sale. This makes a magazine subscription the perfect last minute bargain gift. You can either wrap up a note that the subscription is coming or you can head to the store to buy the latest issue and then add the note with the magazine. Even with buying the newest issue at the store, this gift will cost you less than $10! Or you can send a FREE e-card notification. There is no coupon code or promo code needed for this sale and the prices are valid through Sunday (12/25) at 11:59 pm. Shop the Last Minute Gift Magazine Subscription Sale Today! Somehow my little girl has turned into a tween and with that comes all kinds of new issues to deal with and explore. That is why I was glad to learn about Discovery Girls magazine. Discovery Girls is a destination where tween girls can express themselves, share ideas, connect with other girls and discover helpful tips for handling life’s ups and downs. Discovery Girls articles and features are written by girls, for girls–which means their content touches on topics that really matters to tweens. Their goal is to help girls grow and develop, forming a positive sense of self through solutions that build confidence, resilience and independence. I love how the magazine doesn’t try to be too grown up and that the girls in the magazine are “real girls”. 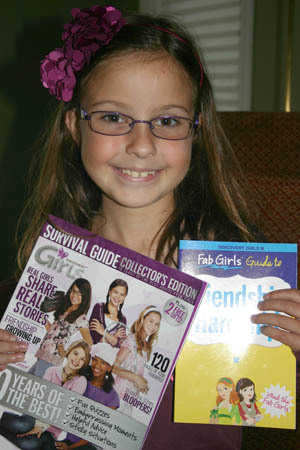 They consider all their readers to be “Discovery Girls” – girls who are curious, strong, and enthusiastic about becoming the very best they can be. (I LOVE all those attributes!) In each issue of Discovery Girls, they feature 12 “Discovery Girls” they’ve chosen to represent the state in the magazine. Every other month, they visit a different state for a two-day photo shoot, during which the 12 Discovery Girls from that state help put together the issue. Overall, I found the magazines to be very age appropriate and great content for tweens. My daughter said that she loved the Discovery Girls magazines. She especially liked that it had stories written by the girls themselves. Discover Girls is offering on lucky reader a prize pack with the following items. Leave a comment on this post with why you would like to win. Everyone must complete the required entry question. All bonus entries are optional. You will receive one (1) additional entry for each completed bonus entry with comment. Bonus entries will be confirmed before a winner is selected and announced. Just leave an extra comment for each as an entry. i.e “I am a fan on Facebook.” and/or “I get your e-mail updates.” You are eligible if you are a new fan/reader or a longtime fan/reader. Be sure to leave each a separate comment. Remember each comment equals one entry. Only comments on the blog will count as entries not comments on Facebook or Twitter. This contest will be open until Wednesday, September 28 at 11:59 p.m EST. Winner will be chosen randomly. Disclosure: This review was made possible by Mom Spark Media. All thoughts and opinions are my own. I was provided a copy of the magaizne and book in order to facilate this review.